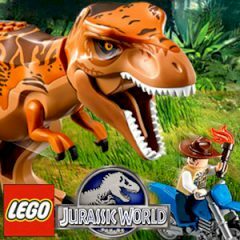 Control the huge dino and run as fast as possible! There are so many bonuses and other exciting challenges. So, everything depends on you, do not waste your time and play this amazing game! Good luck to you and have faith in yourself. Have you ever been in this crazy world? So, now you are welcome to the ancient world, where only dinos were kings of the whole planet! That is why you have a great chance to control it and collect all the lego bonuses. Just be ready for many cool adventures through the ancient world and you will be not disappointed. Are you ready for that? Os, use the arrow keys to move and space to start the race. Try not to be caught and you will love this amazing game! Is everything clear? So, hurry up! Have fun!